Your privacy on the Internet is of the highest priority to My Mountain Cabin Rentals. To better protect your privacy we are providing this notice detailing our on-line information practices. My Mountain Cabin Rentals, LLC want to make your experience online safe and pleasant as your stay in one of our luxury mountain log homes. 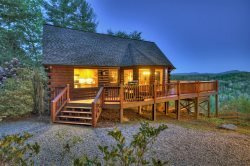 My Mountain Cabin Rentals of North Georgia collects information about you from the following sources: Information you provide on applications or other forms of information regarding your transactions with My Mountain Cabin Rentals. LLC. We use return email addresses to answer the email we receive. These addresses are not used for any other purpose and are not shared with any outside parties. You can register with our website at www.1MyMountain.com if you would like to receive our email specials and newsletters as well as updates on new products, services and upcoming events.